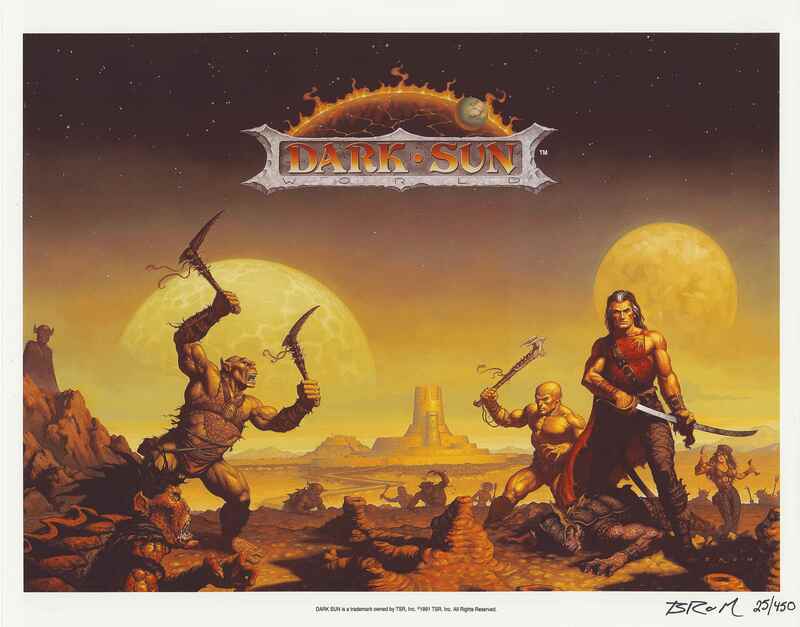 The Burnt World of Athas - 30 Days of Dark Sun 14: What drew you to play Dark Sun? The 14th day of #30DaysofDarkSun is here and the question is "What drew you to play Dark Sun?" The combination of the desert wasteland, the ecological message, the fantastic art, and the departure from standard fantasy are the core reasons I love Dark Sun. Instead of going further into detail, I'll let Shane Hensley say it better than I could. Shane Hensley, designer of City By the Silt Sea, Earth, Air, Fire, and Water and creator of Savage Worlds, had this to say, "I think what most attracted me to Dark Sun was the setting itself and the switch from "looking for loot" to survival. But before I get into that...let me talk about the impact of Brom. Tim Brown, Troy Denning, Brom, Thomas Baxa, and the rest did something that hadn't really been done to this extent before. They literally told you what the world was all about with art. You didn't need a single word to "get it." The art was evocative, stark, and frankly, amazing. It stood out on the shelf and invited you into this amazing creation. And it gets better from there. You start with pure survival...probably a slave in the arena in the first adventure. You escape slavers, run from monsters, and beg for a sword that doesn't break after every hit. What? Running from the monsters? In a D&D game? Yup. That in itself was a revelation. You aren't always going to win. Hell, even your tools--breaking swords and magic that consumes the world--were against you. Your struggle turns from freedom to survival. You run to the desert, hiding from the slavers or whoever else was after you. Slowly, you gain a little power. You get some weapons. You gain a few weapons after surviving the terrors of the wastes. You begin to think of those who drove you out. Getting revenge. Taking back your city. Eventually, after a long fight, you succeed. Then you start thinking about the Green. About the dying planet and how all this struggle will mean nothing if it dies. You explore beyond...the Silt Sea...the Great Ivory Plain...the Dragon's Bowl. The planet needs you. But the things that threaten it are incredibly powerful. You're a champion of Athas now...can you unravel the mysteries and defeat the ancient and powerful Dragon Kings?" Robert Schwalb, designer for 4th edition Dark Sun and creator of Shadow of the Demon Lord, had this to say, "I picked up the first boxed set in high school and gave it a spin, but it wasn't until my friend Bobby started a campaign that I got sucked in. We played for several years, running through the main adventures with character from our various character trees. I've loved the setting ever since."